Los Angeles, CA (November 28, 2017) — RCA/Inspiration recording artist TRAVIS GREENE received a 2018 GRAMMY® nomination today for “Best Gospel Album” for his chart-topping and critically acclaimed album, CROSSOVER: LIVE FROM MUSIC CITY. The upcoming 60th GRAMMY® award ceremony will take place on January 28, 2018 at Madison Square Garden in New York City. Maximum Artist Management was founded in 1998 by Solarek with his first client, Natalie Grant. The Nashville-based firm now comprises a staff of seven, including a recently added manager based in New York. Maximum Artist Management is a Nashville-based artist management, music publishing, development, and touring firm founded in 1998 by Mitchell Solarek. The firm’s roster includes 5-time Gospel Music Association Female Vocalist of the Year and 7-time GRAMMY® nominee, Natalie Grant; GRAMMY® award winning producer and songwriter, Bernie Herms (Josh Groban; Barbra Streisand; Natalie Grant; Danny Gokey); American Idol alumnus, Dove Award winner and now GRAMMY® nominee, Danny Gokey; GRAMMY® and Stellar Award winner, Le’Andria Johnson; GRAMMY® and Stellar® award-winning artist/producer, Donald Lawrence; 3-time GRAMMY® nominee, Tauren Wells; The Voice finalist, Koryn Hawthorne; Hip-Hop/Rap duo, Social Club Misfits; singer/songwriter, Riley Clemmons; Sing-Off winners, Committed; author/speaker Charlotte Gambill; and the women’s event conference tour, Dare to Be. NASHVILLE, Tenn. (November 28, 2017) – Award-winning singer-songwriter Natalie Grant received a GRAMMY® nomination for Best Contemporary Christian Music Performance/Song for “Clean.” This is her seventh GRAMMY® nomination. “Clean” was solely penned by Grant and is on her ninth studio album Be One (Curb Records, November 15, 2015), which debuted at #1 on Billboard’s Top Christian Albums Chart. “Clean” quickly went viral, inspiring stories of healing from fans all over the world. Multiple GRAMMY® nominated Natalie Grant is known for her powerful and soaring vocals, heart-gripping lyrics and passionate performances, and has remained one of the top-selling Christian & Gospel artists since her 2005 breakout RIAA Gold certified album, Awaken. She has since gone on to have nearly 4 million in career sales, and the Gospel Music Association (GMA) has named her Female Vocalist of the Year five times. Learn more at www.nataliegrant.com. The winners will be revealed at the 60th Annual GRAMMY® Awards on January 28, 2018 at New York City’s Madison Square Garden. The telecast will be broadcast live on CBS from 7:30 – 11 p.m. ET. Nashville, Tenn. (Nov. 28, 2017) – MercyMe scored two nods for the upcoming 60th Annual GRAMMY Awards®. The recognition in the Best Contemporary Christian Music Performance/Song category for “Even If” and Best Contemporary Christian Album category for LIFER totals five career nominations for the multi-platinum selling band. The Recording Academy will present the GRAMMY Awards® on Sunday, Jan. 28, 2018, live from Madison Square Garden in New York and broadcast on the CBS Television Network from 7:30–11:00 p.m. ET/4:30–8:00 p.m. PT. The GRAMMY® news tops a notable year for the band. MercyMe’s most recent No. 1 album LIFER debuted earlier this year, with their smash hit “Even If” dominating the Billboard and Mediabase radio charts with a 19-week streak at No. 1 alongside a successful headlining “Lifer Tour,” three GMA Dove Award wins including the Artist of the Year title and their sixth American Music Award (AMA) nomination. 2018 will find MercyMe uniting with fellow GMA Dove Award winners Tenth Avenue North for the aptly titled “MercyMe and Tenth Avenue North Live” hitting over 20 markets along the East and Midwest February through April. The much-anticipated new movie, “I Can Only Imagine,” a true story based on the life of Bart Millard who wrote the mega-hit song “I Can Only Imagine” after the loss of his father to cancer, opens in theaters Mar. 16, 2018. For the latest information, visit www.MercyMe.org. GRAMMY® nominated LIFER is available at iTunes, Spotify, Amazon, Google Play, Cracker Barrel, LifeWay and more. Since their debut in 2001, GRAMMY® nominated, multiple American Music Award and Dove Award winners MercyMe have sold more than 9 million units in CD, single and DVD sales, garnered more than 57 No. 1 multi-format radio singles and four consecutive mainstream radio hits with “I Can Only Imagine,” (No. 4 AC/Top 25 on Top 40/Hot AC), “Here With Me” (No. 4 AC), “Homesick” (Top 10 AC) and “So Long Self.” Their radio success has continued with recent singles “Flawless” (No. 1 for 15 weeks) and “Greater” (No. 1 for 16 weeks), landing them the Top Christian Airplay Artist spot on Billboard’s 2015 Year End charts. MercyMe made history in 2014 as “I Can Only Imagine” surpassed 2 million digital downloads, making it the first song in Christian music to go platinum and double-platinum in the digital domain. In 2009, Billboard named MercyMe’s “Word Of God Speak” the No. 1 Song of The Decade and the group the No. 1 Artist of the Decade in both the Christian Songs and Christian AC Songs categories, recognizing them as one of the industry’s most notable talents. They have sold out venues throughout the US and Canada, including Radio City Music Hall, and have appeared on the Macy’s Thanksgiving Day Parade, The Today Show, CBS This Morning, The Tonight Show with Jay Leno, FOX New Channel’s FOX & Friends, CNN, ABC News and in the pages of Entertainment Weekly, The New York Times, USA Today and more. MercyMe’s eighth studio album, Welcome To The New, garnered two GRAMMY® nods, four radio hits, has been certified gold by the RIAA and continues to be a top selling title. LIFER, their latest chart-topping, GMA Dove Award winning and GRAMMY® nominated album, includes the smash hit “Even If” which dominated the Billboard and Mediabase radio charts with a 19-week streak at No. 1. November 20, 2017 (Nashville, Tennessee) –Julie Elias is set for a Thanksgiving holiday filled with gratitude as the Christian entertainer celebrates a career first of breaking into the Top 50 on the Billboard Christian INSPO/Soft AC charts alongside the release of her new album, “A Girl Like Me.” The chart-climbing single, “Awaken,” is the debut release from the 12-song album. “Thanksgiving, for me, is always a time to stop and reflect on the blessings in my life,” Elias says, “This year, I’m especially grateful that my music is connecting with people and I’m excited for how well ‘Awaken’ is doing at radio, especially at the same time that my new CD is out. In addition to “Awaken,” which is inspired by Romans 13:2 and, according to Elias, “is about closing the chapter of darkness in your life and stepping out into the light, committing to God that you’re ready to obey Him and do His work,” the CD features songs centered on the theme of 2 Corinthians 12:9-10. Elias’ new CD showcases various musical styles. “Forgive Me,” a song about repairing a relationship, and “Only For Awhile,” a semi-autobiographical song about how the seasons we go through in life make us who we are, feature the musician’s signature piano-pop style. Two worship songs, including a cover of Kim Walker-Smith’s “Alive” and “Unchained,” which Elias wrote, are on the project. A theatrical ballad reminiscent of 80s rock titled “Wherever You Roam” was penned with high school graduates in mind as they prepare to embark on their first experience away from home. “Run Away” and “Lost,” two songs written about times when Elias trusted God rather than flee a situation, are also on the CD. The musician, who counts Sara Bareilles, Kelly Clarkson, Carrie Underwood and Francesca Battistelli among her influences, tours regularly in support of her music and ministry. Elias has a number of performances set for the remainder of the year, including shows in the South and on the West Coast. For more information about Elias, visit julie-elias.com, like on Facebook and follow on Twitter and Instagram. 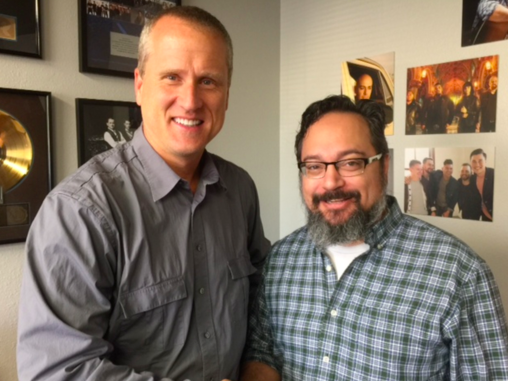 Dove Award-nominated singer, songwriter and worship leader Todd Agnew has signed an agreement for representation by respected booking agent Scott Huie of H2O Artist Agency. Agnew joins the agency’s growing roster of Christian artists that includes Platinum®-selling, GRAMMY®-nominated Newsboys, GRAMMY®-nominated recording artist Peter Furler; GRAMMY®-nominated singer/songwriter Ryan Stevenson; Dove-nominated band Rush of Fools; hard rock mainstay Seventh Day Slumber; and up and coming new artists Ashes Remain, Austin French, and DJ Maj.
“I’m thrilled to join forces with H2O Artist Agency,” says Agnew. “Scott Huie has a stellar reputation in the industry as a man of vision and integrity, and I’m extremely honored to be working with him. Nashville, Tenn. (Nov. 17, 2017) – “I Am Found,” the just unveiled single from Brad + Rebekah’s upcoming album, marks the husband-wife duo’s first song from their upcoming full length project. The new album, due out in early 2018, is the worship pair’s first release since 2015 and their seventh album. 17 November 2017 – Franklin, Tenn – It was twenty-five years ago on November 18, 1992 that Steven Curtis Chapman released The Great Adventure, an award-winning album and single that would be a turning point in his career. The Great Adventure would go on to earn Chapman four Dove Awards – Song of the Year, Pop/Contemporary Recorded Song of the Year, Short Form Music Video of the Year, as well as for Pop/Contemporary Album of the Year. The album also won the 1993 GRAMMY® Award for Best Pop/Contemporary Gospel Album. In celebration of its 25th Anniversary, Chapman has recorded a brand new version of the title track, “The Great Adventure,” along with Bart Millard. To coincide with the song, a new music video has also released. The single is now available on iTunes, Amazon and Spotify. Be sure to check out the video below. ABOUT STEVEN CURTIS CHAPMAN: In a career that has spanned 30 years, Steven Curtis Chapman is the most awarded artist in Christian music history with 58 Gospel Music Association Dove Awards, five GRAMMYs®, an American Music Award, 48 No. 1 singles, selling nearly eleven million albums, and eight RIAA-certified gold or platinum albums to his credit. He has been on “Good Morning America,” “CBS Sunday Morning,” CNN, MSNBC, “60 Minutes,” E! Entertainment, “The Today Show,” “Fox & Friends,” “CBS This Morning,” and “The Tonight Show,” along with appearing in the pages of People, Billboard, Parents Magazine, and more. With countless tours under his belt, Chapman continues on the road performing at numerous festivals and events, headlining the successful Rock & Worship Roadshow earlier this year. He will headline the 6th Annual KLOVE Christmas Tour this holiday season, which kicks off November 25 in Little Rock and runs through December 17 in New York City. Chapman released his memoir, Between Heaven & The Real World, on March 7, 2017 (Revell) and appeared exclusively on “Fox & Friends” to talk about the book. Between Heaven & The Real World also made the Publisher’s Weekly best-sellers list two times and the Evangelical Christian Publishers Association best-sellers list. For all the latest tour dates and for further information, please visit www.StevenCurtisChapman.com and on his social links below. Nashville, Tenn. (Nov. 17, 2017) – Singer/songwriter Sara Groves released her 13th studio album, Abide With Me, to critical acclaim today. The widely praised release comes on the heels of Grove’s recent performance at the Ronald Reagan Building in Washington D.C., where Groves was the featured musical guest for Christian Music Broadcasters’ gala dinner, performing three songs off her new record. Groves was joined by keynote speaker Gary Haugen, CEO of the International Justice Mission (IJM), with which Groves has joined forces to advocate for victims of human trafficking for the past 12 years. The event was a part of an exclusive CMB preview of Museum of the Bible, where broadcasters where invited to Washington D.C. to tour the museum before its grand opening. Abide With Me is now available on iTunes, Amazon, Spotify and Google Play. Sara Groves is a mom, wife, singer/songwriter and recording artist with a passion for justice and a heart of mercy. She has joined forces with International Justice Mission to advocate for victims of human trafficking for the past 12 years. Groves, her husband Troy, and their three children (Kirby, Toby & Ruby) reside in St. Paul, Minn. where they cultivate an artist support community out of a 105 year-old church called Art House North. Abide With Me marks her tenth release with FairTrade Services, and is available now. Creative Soul Records artist Frances Drost almost gave up on Christmas. She secretly dreaded Christmas because as a young girl, she had tragically lost two siblings. Christmas called attention to their absence, and she simply didn’t know how to make sense of the incredible loss. Frances began to write songs about her journey — an audio journal of sorts — and years later, it turned into the Christmas album, Portraits of White (Creative Soul Records). Portraits of White is a beautiful wintery mix of familiar carols and soon-to-be classics. For the past three years, Frances has turned the album into an increasingly popular winter concert experience, complete with a 27-piece orchestra. Portraits of White has quickly become a holiday highlight in south central Pennsylvania. This year’s holiday spectacular is scheduled for December 9, 2017 at 7:00 p.m. at Christ Community Church (1201 Slate Hill Road, Camp Hill, PA 17011). Tickets are on sale now at www.portraitsofwhite.com.